An online crowdsourcing initiative of the FASoS MUSTS research group, Worlds of Wonder, was launched last week. Worlds of Wonder is part of an NWO-funded PhD project that invites citizens to help analyse illustrations in nineteenth-century microscopy journals and books – anyone can join and research the history of microscopy! 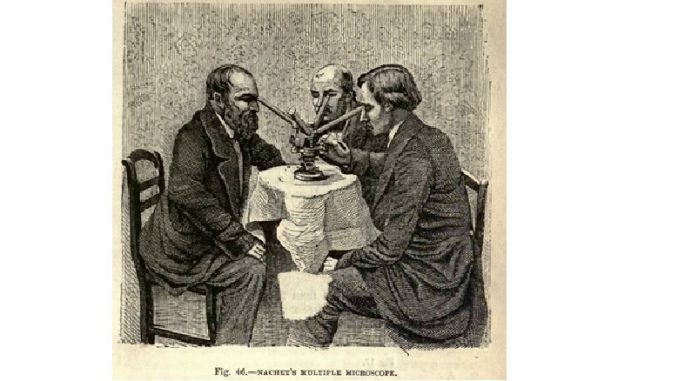 In the mid-nineteenth century, opticians started to produce relatively cheap microscopes and microscopy became a popular leisure activity. Many journals and handbooks on microscopy appeared, which were often richly illustrated. The aim of Worlds of Wonder is to learn more about these illustrations, how they were made and distributed, and how scientists and illustrators collaborated to produce them. To this day, so many nineteenth-century publications on microscopy remain that they can hardly be analysed by just a handful of researchers. Therefore, the MUSTS researchers behind Worlds of Wonder, Lea Beiermann, Cyrus Mody and Raf De Bont, ask citizens to help them classify microscopy illustrations, assign keywords to the illustrations to make them searchable, and identify the people who made them. You can join the project on Zooniverse or learn more about the history of microscopy on the Worlds of Wonder blog.